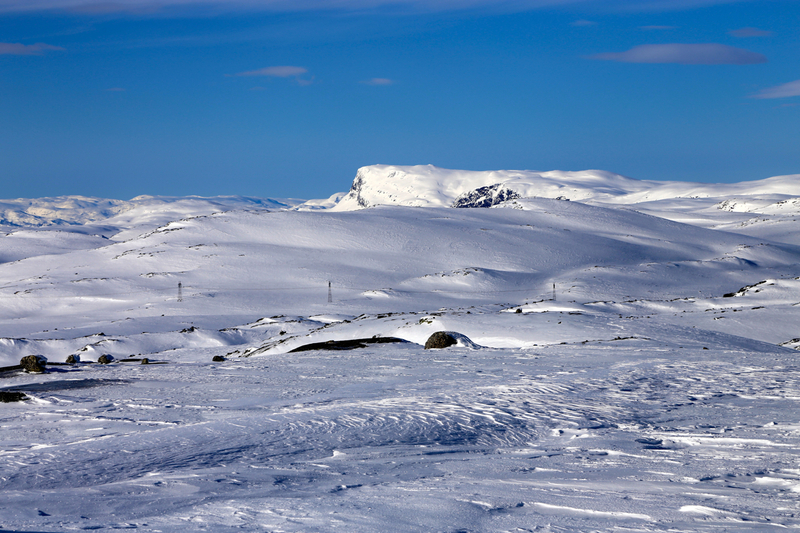 A good starting point is Finse, the highest railroad station on the Bergen to Oslo line. 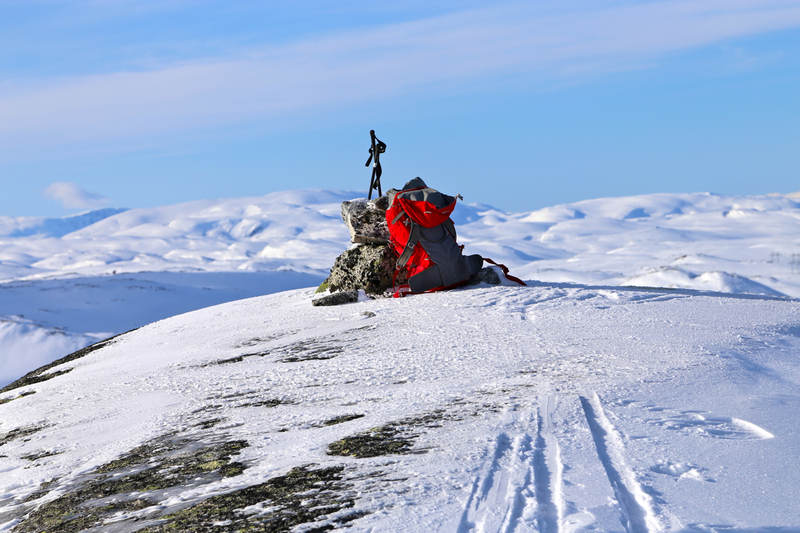 I skied quite a nice route, starting from Finse. First, ski past the Store Finsenuten, 1599m. This can be done at either side of the peak. Continue to the northwest of Store Finsenuten, directly towards the south face of the next peak also marked with 1599 meter of elevation. Follow the valley downhill to the northwest in the direction of Larsdalen. As soon as the valley widens and the downhill slope turns more gentle, contour more directly east to reach lake 1341 between the two small hills marked at 1352 and 1357. The summit is now straight ahead (up the slope that comes down on your right hand side. Ascend this slope, it narrows higher up, but connects nicely to the final summit slope. 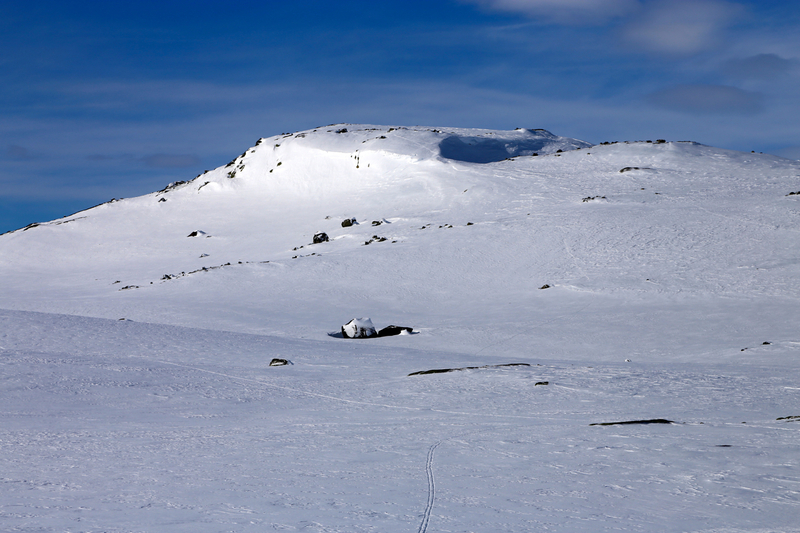 Finally, proceed on more gentle slopes to the small summit cairn. I left Finse around 0800. The weather was looking very good. Ascending the col west of Store Finsenuten was fun and picking a nice line around, then down below the other 1599 peak was quite nice. Not a single ski track to be seen anywhere, beautiful conditions and sunshine across all slopes and summits. The final climb was easy and the somewhat narrow passage onto the final summit, easier than what it looked like from far below. I reached the summit at 1035, enjoyed the good scenery in all directions for about 10 minutes, then started back down. A very nice ski and a somewhat more direct route, this time crossing around the Store Finsenut on its eastern side, brought me back to Finse at 1230. Vassfjøra, as seen from the summit.